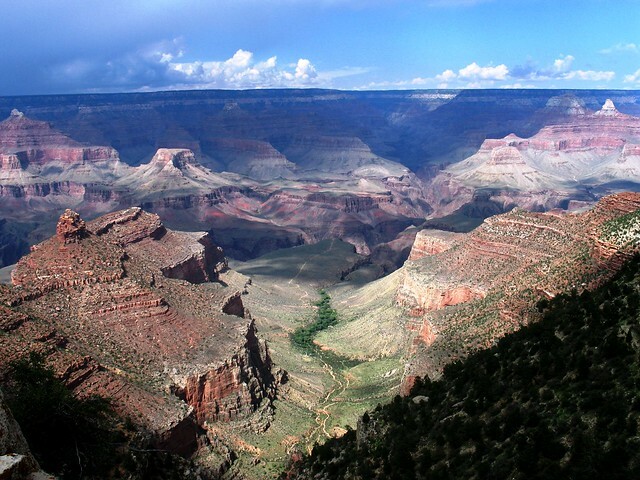 One of the most iconic spots in the United States, the Grand Canyon attracts nearly 5 million tourists every year. Most visitors follow a similar itinerary – drive to one of the nearby parking areas (cars are prohibited in the park due to congestion/pollution), board a shuttle bus to hotel/campsite, and then explore the park from there. What if I told you there was a way to reach the Grand Canyon in style and comfort, while also getting big savings on your accommodation in the park? True story: it’s called the Grand Canyon Railway. 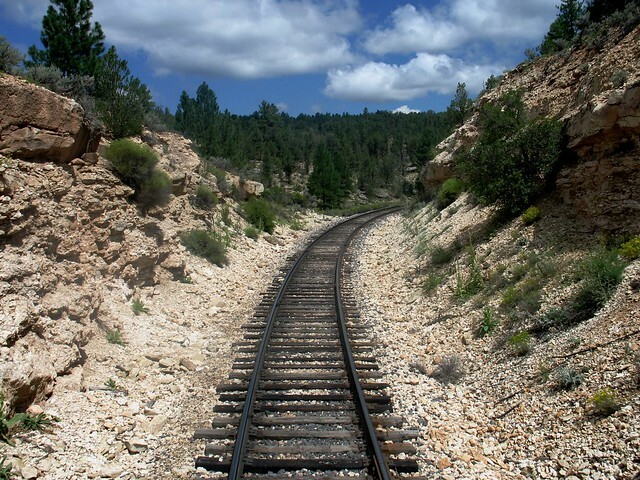 While the idea of a train into the Grand Canyon park might seem like a modern way to reduce congestion and pollution (incidentally, the railway is a pioneer in using vegetable oil as fuel), the railway here was first put use in 1901. Back then, the canyon was quite the adventure to reach. Pioneers in the area convinced the Santa Fe Railroad that the extension would be profitable – and it was. It was so popular, in fact, many of the cabins and other amenities now mainstays at the Grand Canyon were built by the railroad, seeing they needed somewhere to put all those train passengers. The railway closed in 1968 with declining ridership, due to the popularity of independent automobile travel. Entrepreneurs took over the railway and its aging equipment in 1989, re-opening the lines and now keeping over 50,000 cars each year out of the Grand Canyon National Park. Your “Rail to Rim” adventure today starts in Williams, Arizona, a small town about 2 hours and 45 minutes from Phoenix Sky Harbor airport. Williams is a stop on the old Route 66, so you may want to consider arriving early or extending your stay afterwards to explore some of the interesting stops nearby. Trains depart each morning from Williams to the canyon at 9:30AM sharp, so more than likely you’ll be spending a night here. That’s good news, because I do love the Grand Canyon Railway Hotel located across the street from the train depot; there’s a nice pub in the lobby and you can walk over to Route 66 for more dining options. From Williams, the train route takes about 2 hours to travel the 65 miles to the canyon rim. 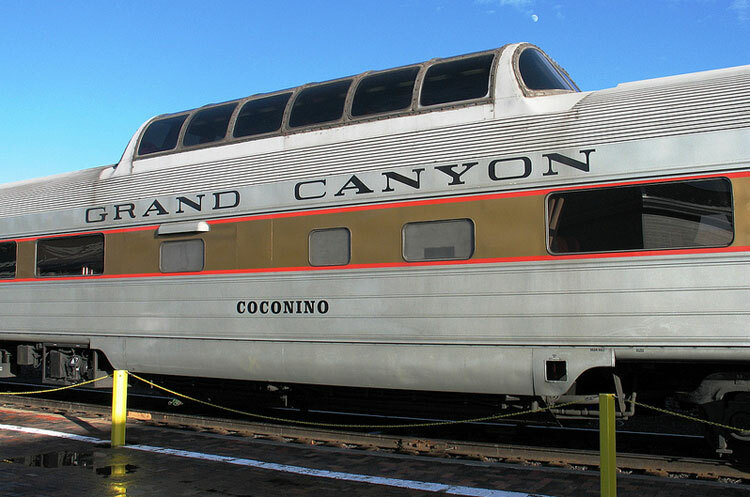 The route is relatively quiet, making the trip very peaceful and will give you an opportunity to plan out your canyon activities, or simply just relax and enjoy the comfortable train interiors, which have been restored to pristine condition. The train has six classes of service; while it costs twice as much as coach class, I think the Observation Dome car or the Luxury Parlor car are both worth it, for the comfort level, as well as snacks and refreshments provided. The train drops you off literally steps from the edge of the canyon, right in the middle of the Grand Canyon Village, making it easy to hop on a shuttle or simply walk to your next destination. Trains return back to Williams at 3:30PM sharp, so you do have a couple of hours to explore if you wanted to return on the same day, but you’ve come so far, why not spend the night? Some of the best sights in the park require a little bit of time to reach, so it is truly worth it. TIP: Book your park accommodation at the same time you book your ticket – the train/hotel packages are so good, sometimes you’ll save more on the hotel than you paid for the train, making it very much worth it. If you’re looking for the best value for your comfort, I suggest Maswik Lodge, which is within walking distance of the station. Getting around the park is easy using the extensive shuttle system that is free to use (your train ticket pays for park entry). The system runs several loops throughout the park, which means you may have to switch buses but you can get from one end of the park to the other in less than an hour. Eating: The Arizona Room at El Torvar is simply divine – but you’ll want to get a reservation. Bright Angel Lodge also has a nice, simple dining lounge and a wonderful soda fountain for a midday treat. Souvenirs: You shouldn’t have any trouble finding a good souvenir (photos are the best souvenirs), but there is a lovely little shop and outlook at the west end of the park, Hermit’s Rest. TIP: Water bottles are not sold in the park. However, drinking fountains with fresh water are everywhere, so remember to pack your own water bottle, especially since the heat and dry air can quickly dehydrate you. Just please dispose of your water bottle properly to prevent damaging the park. TIP: The book Path of Beauty: Photographic Adventures in the Grand Canyon will get you even more excited about your trip. What do you hope to see when you visit the Grand Canyon? Great article. We traveled cross country several years ago with our three young daughters in tow and one of our stops was Grand Canyon. Now the kids are out of the house, so I look forward to lots of travel with my husband. 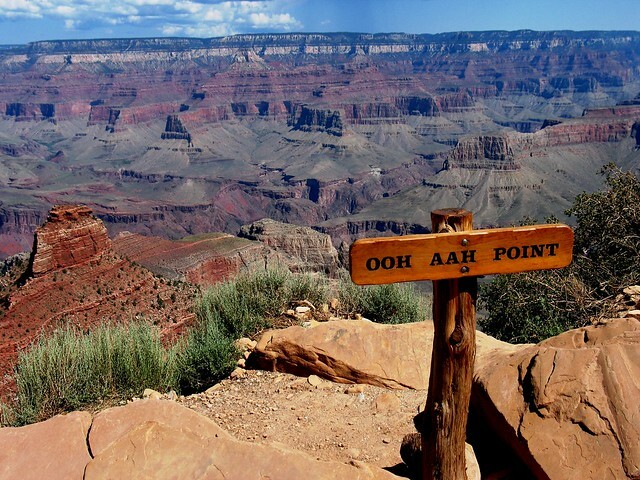 This sounds like a great way to visit Grand Canyon again!